The attempt to force the Dardanelles and land the Mediterranean Expeditionary Force began in April of 1915. The fighting between the ANZAC and British troops against the Ottoman forces of Liman von Sanders and Mustafa Kemal settled in to trench warfare beginning on May 4, 1915 (Keegan, 1998, p. 247). The need to end the stalemate precipitated General Sir Ian Hamilton to order an offensive to break the Turkish lines in the summer of 1915. The offensive was ordered for August 7, 1915 and called for an amphibious landing at Suvla Bay. Suvla Bay was north of ANZAC cove, which had been the scene of some of the heaviest fighting of the campaign. British troops quickly established a bridgehead in the early stages of the landings, but the Allied forces made no more gains on the peninsula. Kemal's Ottoman forces rushed reinforcements to Suvla Bay and took control of the heights, penning the British forces against the sea. The arrival of Ottoman reinforcements at Suvla created another opposed foothold held by the Allies and prevented any British breakthrough. 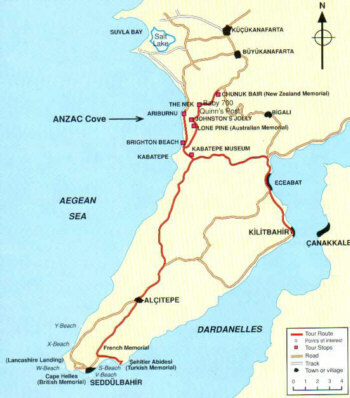 The Ottomans had fourteen divisions opposing an equal number of Allied visions at ANZAC cove, Cape Helles, and Suvla Bay. The August offensive had accomplished nothing but the addition of another front in the Gallipoli campaign. The plan had called for simultaneous action on the part of all Allied forces on the peninsula. The ANZAC forces were ordered to launch a frontal assault on the Lone Pine Trench and the British 29th Division was to engage in a holding action at Helles (Rhodes James, 1965). The assignment of landing at Suvla Bay was given to the British 10th and 11th divisions, both Kitchener brigades seeing their first action. During the early stages of the landing, Hamilton personally intervened in the battle and ordered the British forces to dig in on the crest line (Rhodes James, 1965). Hamilton's orders resulted in the retreat of the advance units and the green divisions were eventually decimated by an Ottoman charge (Rhodes James, 1965). When the Ottoman forces broke the British line at Suvla Bay, the landings were rendered a defeat. During the Battle of Suvla Bay, the British suffered nearly eight thousand casualties and made little gain in position (Rhodes James, 1965). 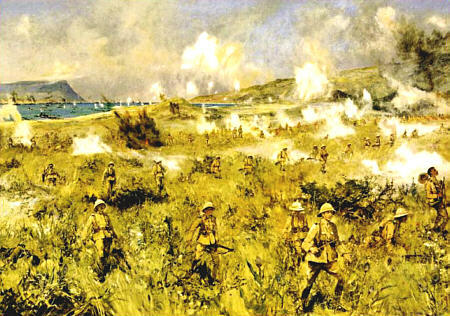 In the aftermath of the Suvla Bay landings, Hamilton shifted the British 53rd, 54th, and 29th divisions to reinforce the troops at Suvla Bay and attempted a final breakout on August 21 with the assaults on Scimitar Hill and Hill 60. In the overall action during the August offensive, the Allied forces suffered eighteen thousand casualties (Rhodes James, 1965). In the aftermath of the Suvla offensive, Sir Charles Monro replaced Hamilton as commander of allied forces (Keegan, 1995). Monro persuaded Secretary of War Kitchener of the necessity of evacuation, when the former was on a November visit to the front (Keegan, 1995). The August landings at Gallipoli represented the final flourish in a battle that claimed over 300,000 Ottoman forces and 265, 000 Allied Forces (Keegan, 1995). James, Robert Rhodes. Gallipoli. New York: Macmillan Company, 1965. Keegan, John. The First World War. New York: Viking Press, 1995. Click "Back" Icon to Return to Page.